Mother gives her adopted son her kidney after miracle match. INDIANAPOLIS, Indiana — From foster mom, to adoptive mom, to kidney donor. This family took in a little boy and gave him a lifesaving gift. Nicole Alles and her husband have been fostering children for more than a decade. A few years ago, the couple decided to take a break and decide if this is what they wanted to continue doing. That’s when they received a call about a baby boy that no one was willing to take in. “WE got a call for him in December and they couldn’t find anyone to take him in because of all of his medical complications,” said Nicole. Sebastian was born in October of 2014 with a long list of health concerns including end stage renal, collapsed lungs and stage 4 chronic kidney disease. 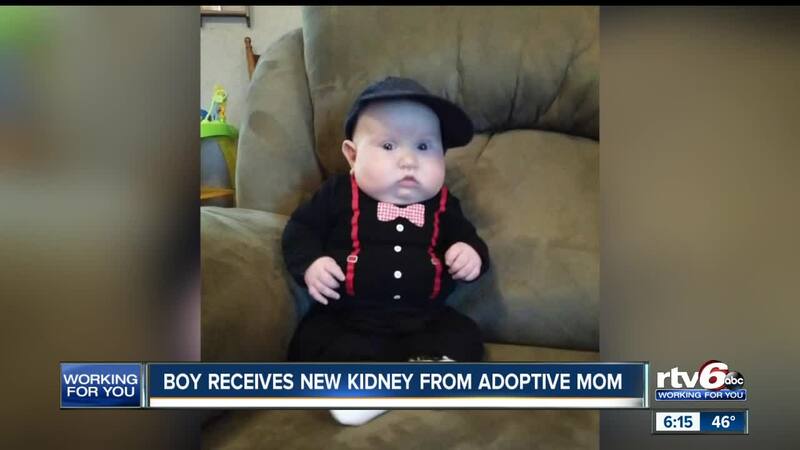 "I mean the biggest issue was that his kidneys weren't working and we knew we were going to need to start him on dialysis before he even left the hospital,” said Dr. Myda Khalid, children’s kidney doctor at Riley Hospital. Sebastian would eventually need a new kidney. Nicole, a home healthcare nurse, knew she could help Sebastian. The couple took him in and she did his dialysis at home. "We took him in under the premise that he would probably go back home soon, but that did not happen,” said Nicole. After four months, Sebastian’s biological parents discontinued their parental rights. In 2016, the Alles family legally adopted him. His two foot tall box of medical records was delivered to their home shortly after. That’s when Nicole learned she and her newly adopted son shared a blood type. After waiting for Sebastian to be strong enough for a transplant, Nicole went through extensive testing and learned she was a match. “When they found out I was a tissue match for him that was when we were just so excited because that just meant so much to us that I was able to give him the kidney,” said Nicole. Today Sebastian is one year post operation. He’s healthier than ever. His kidney transplant, one of many successful surgeries he’s had to improve his quality of life. “To look at him, you really wouldn’t know he’s been through as much as he’s been through,” said Nicole. Nicole believes Sebastian was meant to come into her life so she could be his mother and his donor. “Being able to save his life... it makes me very emotional, very fortunate... very blessed... very happy because I know that I was a part of that,” said Alles.